My frequent co-conspirator Ken Penner and I, with the assistance of Nick Meyer, have been working on something I pitched to Ken last summer: The Lexham Dead Sea Scrolls Hebrew-English Interlinear Bible. We chatted about it in November at SBL (at a very yummy churrascaria) and early this year began working on it. In the above, the light grey text is the text of the Lexham Hebrew Bible (LHB). Interlinear units that contain material from the Dead Sea Scrolls (DSS) is in black, though brackets do note the inclusion/exclusion of LHB text. 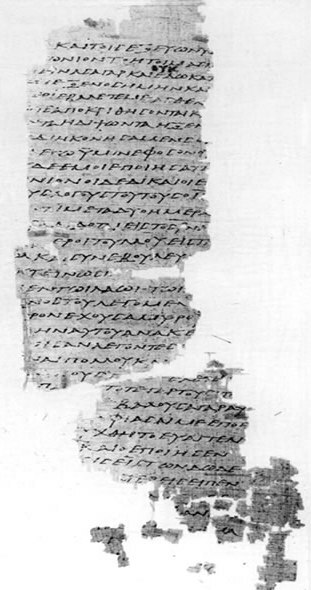 Two layers of interlinear glosses are included, and the source of each reading selected is noted. When a source has orthographic (spelling) variations in other DSS sources or is at orthographic variance with the LHB, an asterisk notes more information on these differences including a link to the transcriptions in question. Where more than one manuscript preserves part of a biblical text, the reading selected is the oldest complete word preserved in the Scrolls. The scroll dates used for this purpose are those collected by Webster’s Chronological Index of the Texts. Our procedure for handling cases where no manuscript has completely preserved a word is to consider the letters individually. Further, it uses the lemma and morphology scheme used by the Lexham Hebrew Bible, so one can search both resources contemporaneously for lexical or morphological criteria, or even use the “Corresponding Words” and “Corresponding Selection” features of Logos Bible Software to compare the texts side-by-side. We’re excited about this resource and its future, and glad we could get a version of it into Logos 7. When I was at the SBL National Meeting in November, my friend at the Hendrickson booth provided a review copy of Codex Sinaiticus: New Perspectives on the Ancient Biblical Manuscript. The book is a collection of 22 papers given at the 2009 conference on Codex Sinaiticus that corresponded with the release of high-quality images of the codex at CodexSinaiticus.com. While I have read (and enjoyed) all of the essays, I will not recount all of them here. Instead I’ll talk about the volume as a whole. For my interests, I was thrilled to see papers focusing on the LXX of Sinaiticus (Section 2) as well as discussion on the text of Hermas (Section 3). I was familiar with most of the larger issues in the Modern Histories section, though the essays contained particulars that I did not know. I read Section 5, Codex Sinaiticus Today, with interest because it discusses issues having to do with the digitization, transcription, and reconstruction of the codex. While I appreciate the difficulty of the project and what it achieved, I wonder how it might’ve proceeded differently if they’d been able to release iteratively instead of as a complete piece. Note that Hendrickson has PDF of the front matter (20 pgs) online. You may or may not have heard, but my employer (Faithlife, makers of Logos Bible Software) has shifted our flagship product, Logos Bible Software on the desktop, to a six-week release cycle. We’ve also introduced a subscription model called Logos Now which provides access to the latest features and datasets that otherwise would’ve waited to be integrated with a major software release. There’s even a video with more information. 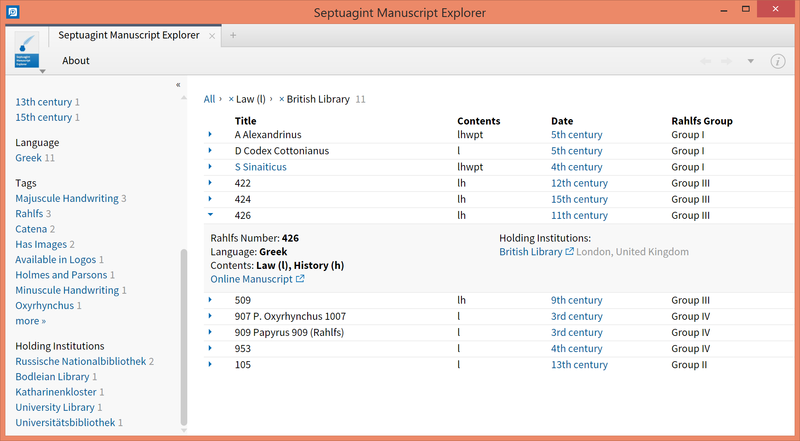 Earlier this week, we released (again, for Logos Now subscribers) a Septuagint Manuscript Explorer. 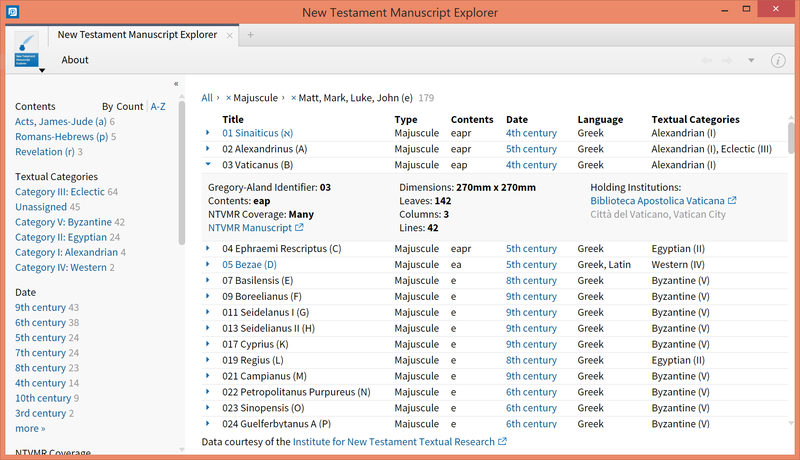 There is less data available for LXX manuscripts, but there is still useful information. For example, what about manuscripts with the Pentateuch (Law) held by the British Library? Boom. Some of them (Rahlfs 426, as seen in the detail) even have links to online images. Why do all this? The first step in bringing this sort of information into peoples’ study is actually aggregating the information and making it available. With the information available, other systems and approaches can be developed. As one hears in the software industry, most complex systems began as simple systems, and they developed over time. Hopefully we’ll be able to use this data as the simple start of a larger system that integrates manuscript information at various levels of study and research.